Perhaps you have a designated brush pile that has been accumulating for years. Perhaps the last of the snow has melted, and old man winter has left you with a plethora of organic garbage to deal with. We can take care of all brush removal for you, whether it's hauling your pile away, chipping your debris into reusable mulch for your flower beds, or taking care of the actual spring clean-up job ourselves. You can rest assured with our efficiency and effectiveness, you'll forget by the end of the day that you ever had a brush problem to contend with in the first place. Perhaps the debris is not yet off the trees. You may have an unruly area of your yard where weed-like plants and trees have virtually taken over. Allow us to clean the area for you. 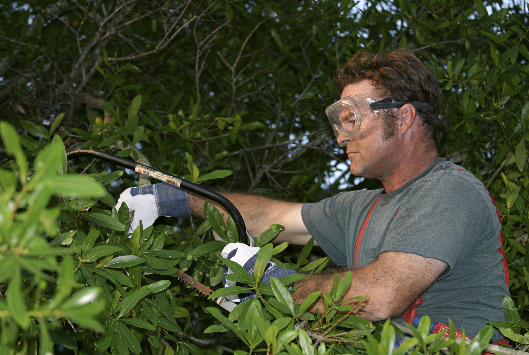 We'll trim the flora you want to keep, cut down the flora you don't, and either haul or chip the remnants for your use. Brush removal is one of those jobs that is boring, time-consuming, and just a royal pain. Take the pain out of the job completely by allowing us to do your brush removal for you. We'll get the job done, and free up your time to spend enjoying your warm weather moments as you want.